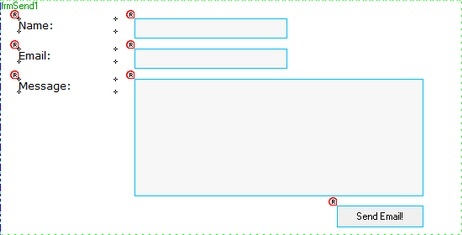 Dynamic HTML Editor 5.5+ permits you to specify one or more validation rules for input fields in a form object. 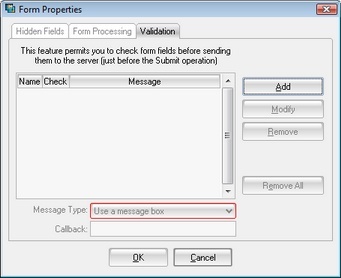 The validation is done on the "onSubmit" event of the Form, just before sending data to the server. 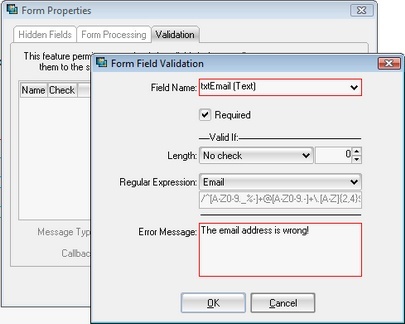 You can choose from many methods to alert the user that a validation error occurred (from a messagebox or a more complex custom function). Now we'll create a simple Contact Form with three input fields, all required; we'll insert Name, Email and Message. We need also one Submit button that will automatically send the data to the server when pressed. The field "Message" has been named "txtMessage" and is a TextArea. The field "Send Email!" has to be of type "Submit"! I added also a "Style" class to the input controls to enhance their appearance. Click on the "Validation" tab and press the "Add" button to add rules; in the next picture you can see that I added the validation rule for the email field. For simplicity I put the callback function into an HTML element at the bottom of this page (check the source .dhe file for the complete sample).